Big Bang has been soaring up the top of the charts ever since DBSK has split. In fact, I think that the whole point of Big Bang was to beat out DBSK. Seems like a legit conspiracy theory. Big Bang debuted in 2006 and has had previous training or experience in the entertainment business. The group has 5 members. 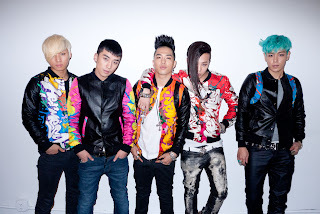 The members are G-Dragon, T.O.P, Taeyang, Daesung, and Seungri. G-Dragon and Taeyang were chosen and to receive training from YG Entertainment at the age of 11. T.O.P was an underground rapper under the stage name "Tempo". "Buckwild" (I hope not that Buckwild song I know from America) was one of his most popular songs. G-Dragon had contacted T.O.P, they were childhood friends, when YG scouts were looking for candidates. T.O.P auditioned but was rejected because to the company he was deemed too "chubby." ( I don't see it or think it was a big deal that he was 44lbs. more than the "ideal" version they were looking for but YG has their reasons) However, T.O.P had worked out to lost the weight, and auditioned again. Go T.O.P! Seungri was the leader of a dance team in his hometown. Daesung was recruited by an open audition and is well known for his strong singing ability. The band debuted on August 19th, 2006. Now I knew someone who was super into the band but I was honestly more of a DBSK fan, however this post is not about DBSK. Big Bang has received both criticism and praise. Time Magazine had stated that they were one of they most "promising" South Korean bands. Their genre is hip hop and hip pop but does have the occasional Rnb song. I agree with Time magazine that this band is a promising band and can push K-Pop in the right direction to help out the bands for world tours. I'm going to admit that I am not a die-hard Big Bang fan. There are some instances where I'm need to take a Big Bang withdraw but some of their songs I truly love is "Lies", "Haru Haru", their Japanese release "Gara Gara Go", Sunset Glow, Fantastic Baby and their debut with the band No Brain in the song "Oh My Friend". My only disappointment is that looking at some of the comments under the video "Oh My Friend" is that 1. the video doesn't even mention that it's featuring No Brain, and 2. Majority of the fans aren't even commenting on the meaning of the song. They're talking about how their fantasy is T.O.P as a cop. I mean come on people where are your morals? The reason I like or listen to Big Bang is because their music is unique, in some songs they have powerful messages, and they have a good bond among each other. Seriously, I don't think the last one is even true...but anyways. I think that when I was in high school I was pushed away from the K-Pop scenes because of how some of the fans acted. It's not that I didn't like the bands and thought that I should punish the bands because of how the fans acted but that's the thing. Fans promote the bands. Do I think that Big Bang is a good band? Yes, but I was always a Cassiopeia more than I was VIP. Do I think the Big Bang is going to rank higher because DBSK is gone? Well Yes if they were lower on the ranks when DBSK was actually DBSK. Big Bang has huge potential and is quite impressive. I don't really dabble into K-Pop so if a band is getting my attention and I own over 3 songs of the band then I really like the band. #3. Haru Haru: I love the story line in this, how ever why wasn't the girl just honest with him? I mean I don't understand how she thought pretending to cheat so he'd break up with her would make him feel any better. Beside that I love the video, and I'm wondering if this is actually a movie because it should be. #2: Gara Gara Go: While I do love Fantastic Baby, Gara Gara Go had me actually looking around when I was in the public library and imagining a whole music video/flash mob dance. Granted the song was in Japanese, this is by far one of my all time favorites. I actually start dancing in my seat or swaying back and forth while listening to this song so if you see me and I'm mouthing Gara Gara Go, then you might want to Go Go because I may end up dancing. #1: Oh My Friend: Yes The collaboration with No Brain. It's not often you see K-pop bands work with Indie bands and I love this music video. Especially when G-Dragon is in a straight jacket and needs his friends to come rescue him. The biggest reason I love the song is the meaning of it. Stating that no matter what the situation or whatever you get yourself into, I'll be there. To sum it all up, I don't hate Big Bang but I don't listen to them a lot. I actually don't listen to a lot of K-pop bands in general except a certain few. I do get attached to some of Big Bang's songs and I do own more than 6. I would love to see them live sometime along with a couple other K-pop bands. If you do have a K-pop band you'd like to suggest to me or any other band head over to the guestbook and put it there. Be aware fan leaders my comments are moderated so all comments will be rejected if deemed inappropiate. If any information is not correct please contact me and let me know.